Boho interior is known (and loved) for its bright tones, clashing textures, various textiles and mix-and-match patterns. While bohemian styling can seem overwhelming, balancing the perfect pieces together in a room creates a fun and fresh bohemian style that is not too over the top. 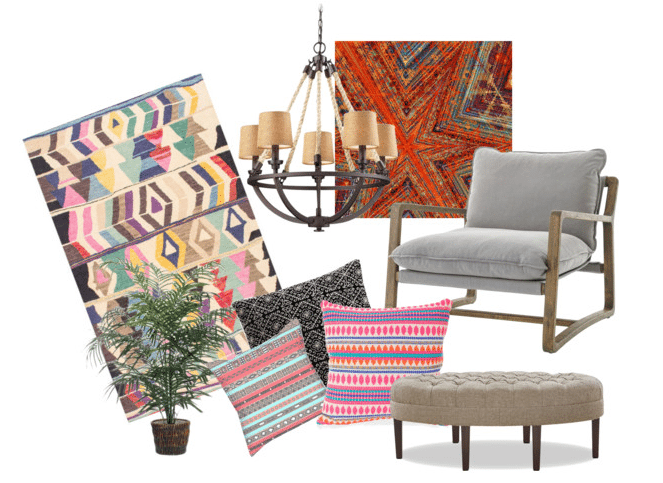 If you need some boho interior inspiration, here are some of the key features of a luxe bohemian space that everyone will love. By far the easiest and most effective way to change up a room is by adding a rug. Look at choosing a rug with a variety of bright colors or a geometric styled pattern. These types of rugs will really translate the boho theme to your room and will surely be an eye-catching piece to any guests in your home. Think Turkish rugs and fabrics found while wandering through the souks of Morroco. Indoor plants are a no-brainer in a natural boho themed space, so look at getting various potted plants to add some color and life to your room. Opt for different shapes, sizes and colors and of course, take care when choosing the perfect spot for your new plant. If you want some ideas on what plants are perfect for indoor spaces, you can check out our recent blog post on 7 Of The Best Indoor Plants For Your Home to give you some ideas. There is a range of options when it comes to artworks for your boho interior space, and you can definitely go multiple pieces rather than one statement artwork. It could be a painting, a collage of personal photographs or perhaps even a hanging rug as a statement wall feature. Bunting is also fun if you are really getting into the boho theme. When choosing a piece of art, make sure it complements other features in your room, whether that be material, colors, patterns or textures. In some boho styled homes, pillows are used for both lounging and decoration. Consider gorgeous, unique patterns when purchasing pillows and don’t be afraid to mix-and-match patterns and colors as the more random they appear, the more natural the boho vibe will look in your space. Think with your bohemian spirit and say goodbye to structure and matchy-matchy tendencies. Add some timber accent pieces into your room to create an organic, natural feel. Consider using some distressed wooden furniture pieces for your chairs and tables to add to the natural vibe to the space, or perhaps create a DIY project with recycled timber pallets (you can make a bed, coffee table or seat by upcycling timber pallets). One of our timber wallpapers, such as Black Wooden Boards, Newport and Pally Post Office would also look great in a boho interior space. Other raw materials like metal, stone and brick will give the same effect. Keep the foundations of the home neutral to bring all of the other crazy elements together. For the boho interior trend, we often see walls and key furniture pieces in neutral shades and textures to really make the boho elements pop. It also makes it easy to bring everything together and change pieces up over time when the foundations are neutral. Like any good outfit, let the accessories do the talking! Give your home the quickest and easiest bohemian makeover by implementing these 6 key features of boho interiors. Don’t be afraid to mix textiles and colors to achieve a space that you will love and enjoy.